Primal Pet Food has voluntarily recalled a single lot of raw frozen cat food. The official press release by the FDA is below, and it can be found here. PetistUSA first saw news of this recall at Truth About Pet Food. 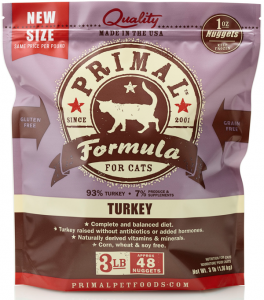 FOR IMMEDIATE RELEASE – March 13, 2015 – Primal Pet Foods is voluntarily recalling a single batch production code of Feline Turkey Raw Frozen Formula 3-pound bag. FDA tested product in response to a single consumer complaint. Primal Pet Foods was alerted by FDA that the testing of two bags of this lot resulted in a low thiamine level. Neither FDA nor Primal have received any other reports concerning Thiamine in Primal products. No other product manufactured by Primal Pet Foods is involved in this voluntary recall. Only the product with the following Best By date and production code is included in the voluntary recall. It is best to check the production code on the back of the bag to determine if the product has been recalled or not. Primal takes very seriously, the need for adequate Thiamine levels in our feline diets. We include Organic Quinoa Sprout Powder as a natural B-Complex supplement to ensure that adequate levels of Thiamine are met. Additionally, Thiamine occurs naturally in other ingredients contained in our Feline Turkey Formula such as: Turkey Muscle Meat (including heart), Turkey Liver, Organic Sunflower Seeds, Dried Organic Kelp, Organic Collard Greens and Organic Squash. Consumers who still have bags of cat food from this lot should stop feeding it to their cats and call us at (866) 566-4652 Monday through Friday, 9:00 am – 4:00 pm PST. Consumers with further questions should visit our website atwww.primalpetfoods.com or call us at this same number.